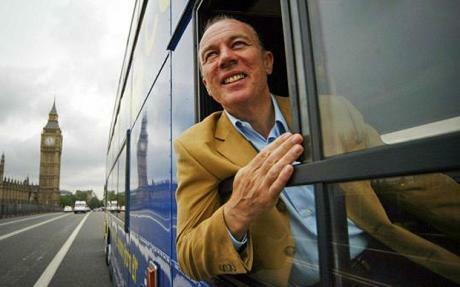 According to a report in the Telegraph, Sir Brian Souter, co founder of Stagecoach, has commissioned a 52ft double-decker – believed to be one of the longest in the world – to carry passengers in luxury leather seats. By night the long-distance bus, which will come complete with hostess service, will have room for more than 40 fully-flat beds. The £500,000 prototype will initially be tested in Scotland, but Sir Brian believes it could eventually fill a niche for middle- class travellers in the US – a market he believes has the potential to transform 31-year-old Stagecoach. An initial investment in 10 of the new buses could total £5m. Sir Brian admitted Stagecoach has been very good at “stacking it high and selling it cheap” in recent years but it has been testing services between Glasgow, Aberdeen and Inverness, where passengers pay about £5 more for a single ticket and enjoy free tea and snacks. Sir Brian said the service between Glasgow and Inverness is faster than rail. A move upmarket would also represent a return to the company’s roots for Sir Brian, who in 1980 launched a Dundee-to-London bus service with his sister, Ann Gloag, where passengers were given sandwiches made by his late parents, Iain and Catherine. Stagecoach expects the prototype luxury double-decker to operate from early 2013. It believes it will be the world’s longest non-articulated double-decker bus. “The proposal would be to introduce the Scottish service initially,” he said. Megabus was introduced in the US in 2006, offering fares as low as $1 (65p). It now carries 18m passengers to 80 cities across North America. Sir Brian said although there are some potential opportunities in Europe, the West is likely to be the source of future growth. Stagecoach told investors that America – where it recently spent £99m buying back nine coach businesses it sold in the early 2000s – could transform its business. Focus Comment. Does anyone know more about this? If you have any information please get in touch with the Focus team.